In our family, we celebrate Saint Nicholas Day on December 6. On the night before, we leave our shoes out and in the morning, they are filled with small toys and treats! Sort of like Christmas stockings.. but with shoes.. and on December 6th, which is the feast day for the saint. And if you’re like our family, you do the stocking tradition too. Because who doesn’t like small things filled with presents, right? 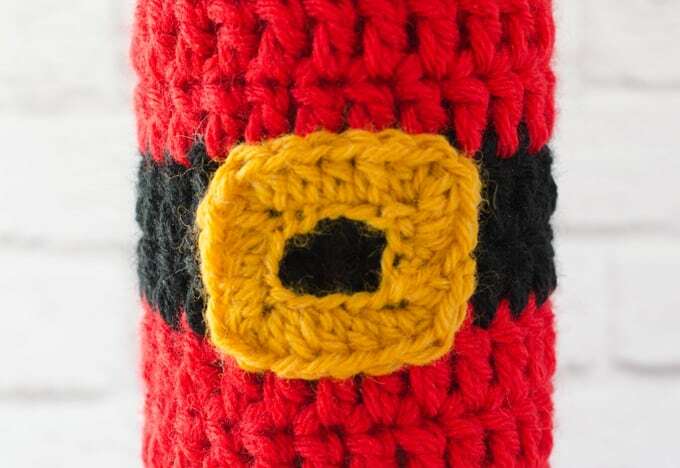 So today is the perfect day to debut this Santa Wine Cozy Pattern! Just like the Snowman Wine Cozy and the Fall Wine cozy, this is a one evening (or less) project. It is worked in a similar way, with 2 strands of yarn held together. Easy Peasy. Lion Brand Vanna’s Choice worsted weight yarn in Scarlet and Black. Small amount of Lion Brand Wool-Ease in Gold. R1: Using 2 strands of Scarlet color yarn, make a magic ring, chain 3 (counts as 1st dc) 11 dc in ring (12 dc total). Sl St to 1st st.
R3-9: Ch 3 for 1st stitch, dc in remaining stitches (24 st) Sl st to 1st st. Change to Black in joining slip stitch of last round. R10-11: With black, Ch 3 for 1st stitch, dc in remaining stitches (24 st) Sl st to 1st st. Change to Scarlet in joining slip stitch of last round. R12-17: Ch 3 for 1st stitch, dc in remaining stitches (24 st) Sl st to 1st st.
R1: ch 16, sl st to form a large ring. R2: ch2, hdc in next 2 ch, 3 hdc in next ch, *hdc in next 3ch, 3 hdc in next ch. Repeat from * 2 more times. Sl st to 1st st. Fasten off. Center buckle over black belt and sew down. If you loved this Santa Wine Cozy pattern, be sure to check out the Fall Wine Cozy Pattern and the Snowman Wine Coy. And.. there is 1 more holiday wine cozy pattern coming up that you won’t want to miss! Sign up for my weekly newsletter so you won’t miss a thing! I love seeing your finished projects! 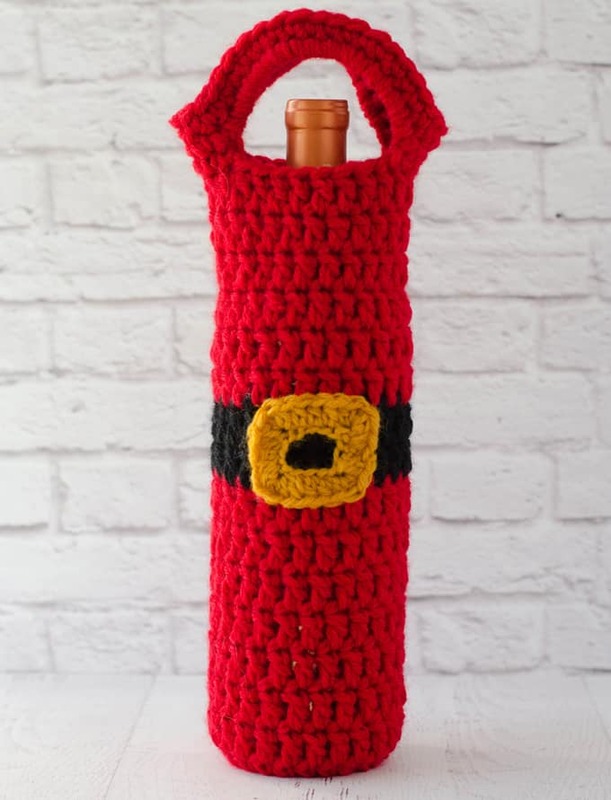 If you share your Crochet Santa Wine Cozy on Instagram, be sure to tag me @crochet365knittoo. If you are on Facebook, stop over to the Crochet 365 Knit Too Facebook page and share a photo! I’d love to see your work! Written pattern copyright Cheryl Bennett 2017, all rights reserved. Please do not reprint or repost this pattern. 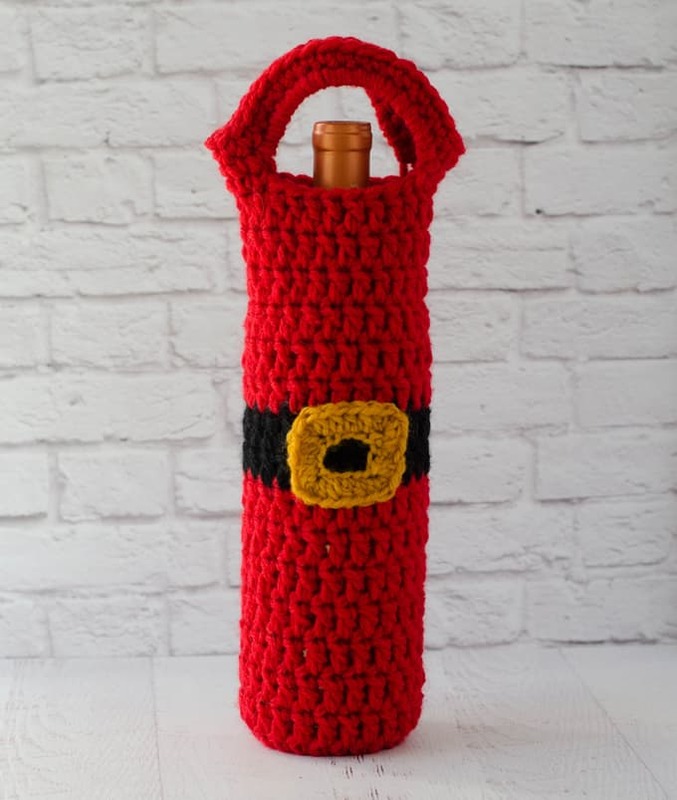 If you would like to share this Santa Wine Cozy pattern with others, just link to this page. To print or download without ads, use the Print Friendly button below or go to PrintFriendly.com. You can also copy and paste the pattern into your word processing software. If you’d like to make items for sale from this pattern, please visit my About page for more information. Thank you to Lion Brand for providing the yarn for this pattern. These patterns are just too adorable! I do have one question …or comment. For the belt buckle, did you mean 3 hdc in the next ch? I have your original post below and I have capitalized the area which I’m talking about. Thanks for the nice complements on my patterns! And thanks for catching my typo! Yes, it should be 3hdc for the corner parts of the belt. I corrected the post. I was having trouble with my software autocorrecting every time I typed “hdc” and I must have deleted the “3” when I was fixing every single HDC in the post! LOL! Lol that is quite alright. I made both the Santa and the snowman one but I add a little something else to the Santa one. I’m going to be putting it on my blog soon because it was so easy and they’re so cute. I almost wish I like wine just so I could use them lol. I can’t wait to see! If you are on Instagram, be sure to post and tag me! I’d love to see your blog posts too! Be sure to link to this page so your readers can get the full pattern here! I’m so glad you are enjoying them. They also fit other liquor bottles and I bet you could find an olive oil bottle that would fit too!